Doc Prothro never played professional baseball until he was 26 years old. He was a dentist with his own practice in Dyersburg, Tennessee pitching for a town team when he was spotted by a scout and signed, skipping the minor leagues and heading straight to a major-league debut in Washington DC. He spent over a dozen years in organized ball, managed in the minor leagues and then as manager of the Philadelphia Phillies from 1939 through 1941. James Thompson Prothro was born in Memphis on July 16, 1893, the oldest child of John and Roberta Prothro. John was a clerk, who by 1920 had progressed to become chief clerk in the U. S. Engineers Office. The Prothros had three daughters: Mary, Roberta, and Marie Evelyn. James enrolled as a student at Castle Heights Military Academy in Lebanon, Tennessee, east of Nashville. There he played football and basketball and competed in track. After graduation, he entered the University of Tennessee’s College of Dentistry at Memphis, only taking out time to serve during the world war in the Dental Corps. He married on October 3, 1917, to a “comely, slender lady of the South,” Katherine Cates. [Unattributed January 10, 1941, clipping in Prothro’s player file at the Hall of Fame] He was known among ballplayers as “Doc” but to Katherine he was “Thompson.” The couple had one child, James Jr., known as Tommy. Tommy Prothro became a star football player at Duke, then a highly successful coach at Oregon State and UCLA, and the Los Angeles Rams and San Diego Chargers. Katherine’s brother Clifton Cates served as Commandant of the United States Marine Corps from 1948 to1954. He went directly to join the Senators and enjoyed his major-league debut on September 26, 1920, at the Polo Grounds in New York. He pinch-hit for pitcher Joe Gleason in the top of the ninth and singled in one of the three runs in a rally that fell short, as the Yankees won the game, 9-5. He appeared in five other games right at the end of the year, singling five times in 13 at-bats (.385). He whiffed four times, too. When the Senators assigned him to Reading in 1921, he took up Griffith’s offer and refused to report. It was back to Dyersburg and dentistry and town team ball for 1921 and 1922. In 1923, he applied for reinstatement with the Senators, and a somewhat astonishing series of transactions followed. By prearrangement, his application was accepted and he was reinstated but immediately sold to the Memphis Chickasaws (Southern Association), a Class A team not coincidentally right in his hometown. Doc played in 111 games for the Chicks, batting .296 with a slugging percentage of .390. He was repurchased by Washington at the end of the Southern Association season and again appeared in six late-season games, this time hitting .250. The following year he opened the season with the Senators and played through June 20 (hitting an excellent .333 in 159 at-bats) but was traded back to Memphis on June 28 (along with Carr Smith) for third-baseman Tommy Taylor. 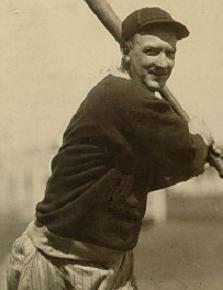 He appeared in 76 games for the Chicks, batting .325 but followed the 1924 World Series from afar. The Senators were world champions, but Prothro was back in Tennessee seeing dental patients as he did in the offseason. Doc Prothro spent just one year with the Red Sox, but it was a good year. The third baseman batted .313 with 51 RBIs in 415 at-bats. This was a dreadful Red Sox team; in fact, Doc’s .313 batting average was higher than the team’s .309 winning percentage. He appeared in 119 of those games, and his 52 walks helped him post a .390 on-base percentage. It was his only full year in major-league ball. He was involved in a three-way deal which sent Bill Wambsganss to the Athletics, sent Prothro to the Portland Beavers, and brought Emmett McCann to the Red Sox. [Washington Post, December 11, 1925] McCann hardly played, appearing in only six games. The Red Sox replaced with the weak-hitting Fred Haney, who led the league in errors, too. The next year (1926) Prothro was gone, to Portland, Oregon where he played with the Beavers in the Pacific Coast League. He hit well again, .327 in 130 games (with 14 homers) and was sent to the Cincinnati Reds in time to get into three late-season games and add one more hit, a triple, and one more run batted in to his major-league resume. That was his last major-league hurrah as a ballplayer. He was sent back to Portland after the season and played there again in 1927, hitting .330 with 10 home runs. At this point, late in 1927 the Chicago Cubs drafted him. He had been discussing an offer to become a playing manager for the Memphis Chicks when the Cubs unexpectedly drafted him. Prothro traveled to Chicago to confer with Cubs owner Bill Veeck, who consented to sell his contract to Memphis on the condition that he was indeed made the manager. He took over the Chicks from Clyde Milan and the team began a turnaround. They’d been a middling club in the Southern Association standings, but he managed the Chicks for seven seasons, playing in each of them, though not frequently after the first three (1928-1930). In 1928, the Chicks finished in second place, just a half-game behind the Birmingham Barons. In 1929, they slipped to fourth but in 1930 won the flag, as they did in 1932 and 1933. His last year with Memphis was 1934, and his playing career ended with a lifetime .312 average in 4,009 at-bats, slightly below the .318 career mark in the majors. After Tom Yawkey bought the Red Sox, he poured money into building Boston a stronger farm system and hired Prothro away to manage the Little Rock Travelers starting in 1935, where he reportedly did quite a good job developing young prospects – and won the Southern Association pennant and playoffs in 1937. One of the prospects who passed through Little Rock was Johnny Sain, who told Baseball Digest that after he was given a workout with the club, Doc signed him and placed him in his first professional engagement with Osceola of the Class D Northeast Arkansas League. [Baseball Digest, November 1946] The Travelers faded in 1938, but Doc moved up in the world, accepting a two-year contract to manage in the National League. From 1939 through 1941, he managed the Philadelphia Phillies. It looked like a job where he couldn’t help but come out looking good; his predecessor, Jimmie Wilson, was coming off a 45-105 last-place finish. Back in Memphis, he took an ownership interest in the Chicks, and served as manager from 1942 through 1947, retiring after the 1947 season and selling his interest in the team to the Chicago White Sox that December. In the 1930s, Prothro had maintained his residence in Memphis but also purchased a 616-acre farm across the Mississippi River in Arkansas. There was even a station there named “Prothro” on the schedule of the Missouri Pacific Railroad. He died on October 14, 1971, in Memphis after a long illness. His widow, son, and all three sisters survived him. In addition to the sources cited above, the author relied upon the online SABR Encyclopedia, retrosheet.org, and Baseball-Reference.com. Thanks to Rod Nelson.